Last modified on Tuesday, May 1 2007. 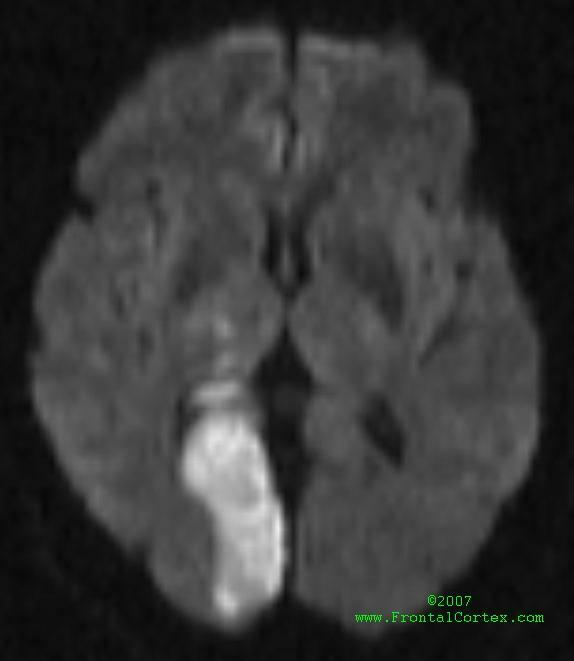 The above is an MRI diffusion-weighted image of an acute infarct. Which of the following vessels is the one most likely to be occluded in this patient? This question was created on May 01, 2007 by jdmiles. This question was last modified on May 01, 2007. The hyperintense area on this MRI shows diffusion restriction as a result of infarction in the territory supplied by the right posterior cerebral artery. 2. Nolte, J. (1993). The Human Brain: An Introduction to Its Functional Anatomy. Mosby, St. Louis.